I had the opportunity to go through some of the pieces of cut up firewood logs at my parents before they were split. Most firewood is from logs that are too ugly or defective for hardwood lumber, but I went through the whole pile and was able to find a few chunks that were relatively free of rot and knots. So I took one of these home with me to cut up on my bandsaw. 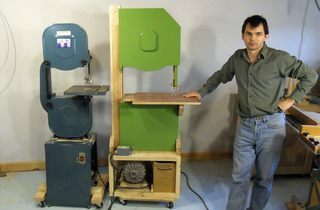 Part of my goal was to really push my homemade bandsaw to the limit. A problem with logs is that they are irregular in shape. 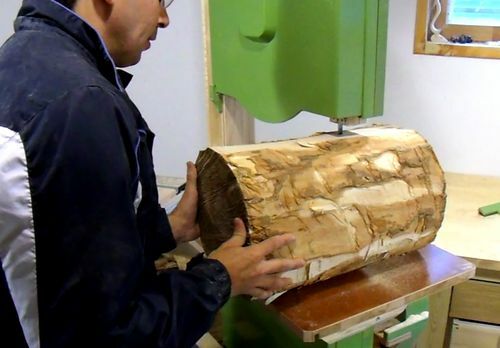 You can get around this problem by putting the log on some sort of bandsaw sled. But this log was too big for that. 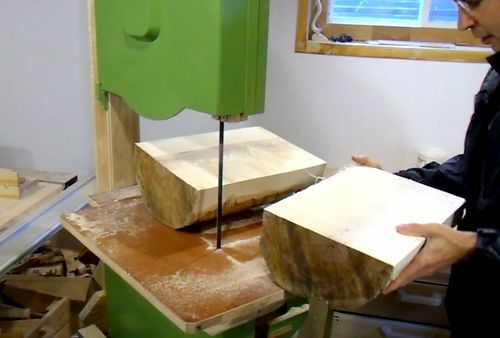 I needed the full 27 cm (11") depth of cut of my bandsaw just to cut through the log, so I couldn't afford to raise the log by putting it on a sled. Instead, I flattened the bottom of the log on my jointer. Note how the log is much bigger than the jointer, but the jointer was just barely wide enough to make a flat spot. The side facing down on the jointer was actually nearly flat to begin with, so I didn't need to cut away much. 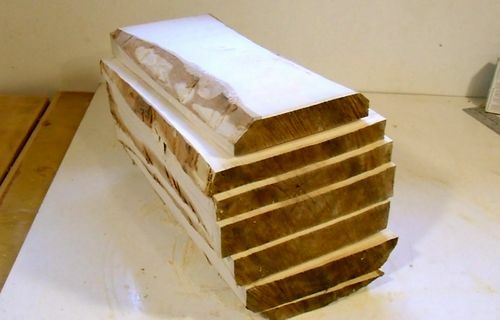 I removed the outer layer of bark before putting the log on the jointer. 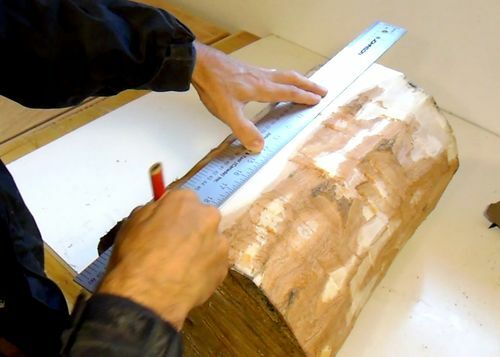 Sand and dirt often gets caught in the bark when the tree is cut and dragged out of the bush, so it's best to remove it to avoid damaging the cutter. I also cut a flat spot on the opposite side, just to make it easier to mark a straight line for where I wanted to cut. Pushing the log through. It was slow going and took quite a bit of force. After the initial cut. I found there was a lot of sawdust stuck to the inside of the kerf. I'm guessing with this deep a cut, the saw teeth just couldn't clear out the sawdust fast enough. An obvious solution would be to cut slower, but for the teeth to bite into the wood, you do need a certain feed rate. I found that as I increased the feed pressure, there was a certain threshold feed pressure above which the blade cut at a good rate, and below which it hardly cut at all. 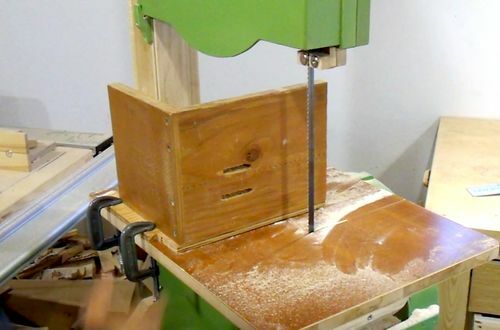 A better solution would have been to use an actual "resaw" bandsaw blade. The blade I'm using is a 1/2" (13 mm) wide blade, with four teeth per inch (6 mm tooth spacing). Resaw blades tend to have fewer, larger teeth, which are better at clearing out sawdust. 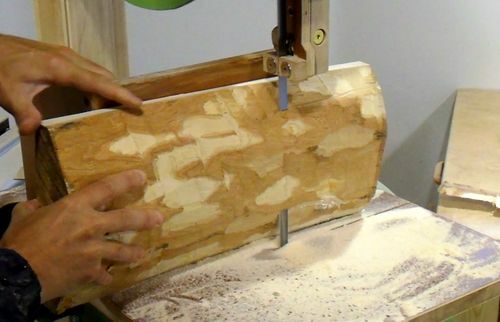 Also, with fewer teeth, you can feed the wood slower yet still have each tooth cut away enough for it to bite into the wood. Resaw blades are also usually wider, which makes the blade better at withstanding pushing forward against it without the risk of it wandering. I compensated for that with my 1/2" blade by cranking the blade tension way up. But what I'll do in the future is probably just pre-cut a kerf with my table saw, like I did this time. If I use a really thin skillsaw blade, the table saw's kerf will be about as wide as the bandsaw blade's. And if I cut 5 cm in from the top and bottom, that will probably put it within reasonable limits of this blade. In the past, I had no problems cutting though 12 cm (5") thick dried maple with this blade. To cut the halves into boards, I improvised a resaw fence. This fence is actually my first really basic tenon jig that I built. I don't cut tenons with it anymore, but it's proven to be quite handy to hold stock vertical on my bandsaw, and also for holding boards when cutting parallel slots on the slot mortiser. It's not as good as a dedicated resaw fence, but I don't resaw that often. Cutting off the outermost pieces went much quicker. 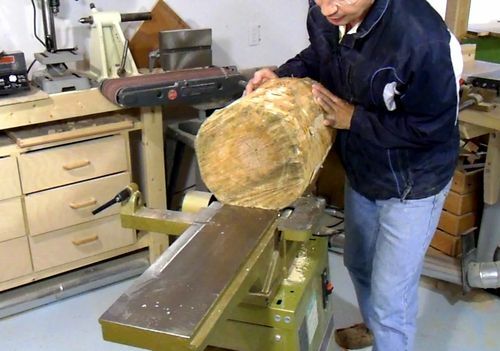 With the roundness of the log, the depth of cut was much less for these pieces, and the blade had no problem clearing all the sawdust out of the slot. I didn't lose much wood to bandsaw kerfs, because my blade has a really thin kerf on account of stoning it. I did run into a bit of a problem with the drift angle. So far, I never had to compensate for the blade's drift angle, but with a 25 cm depth of cut in the wet maple, I had to change my fence angle by about two degrees to line it up with the blade's preferred direction of cut. Fresh hardwood needs to dry for a few years before it can be used. 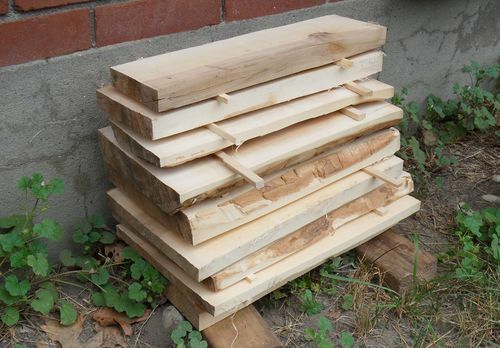 For the time being, I stacked the wood on the south side of my house, where it gets quite warm with all the sunshine. It's under the roof overhang, so it shouldn't get much rain there.